The HALO jump in “Mission: Impossible – Fallout” almost had to be faked. The Royal Air Force would only allow Cruise to do the stunt from 12,000 feet, not 25,000 feet, which would be a true HALO jump. However, after Cruise broke his ankle while attempting a stunt for the movie, everything changed, according to Allan Hewitt, the “Fallout” skydiving coordinator. The HALO jump in “Mission: Impossible – Fallout” took a year to execute, and required special equipment, building the world’s largest wind tunnel for training, and over 106 jumps out of a plane to get it in the film. However, all of that would have been wasted if Tom Cruise hadn’t broken his ankle. In a movie filled with thrilling moments, one of its most dazzling is in the beginning of the movie when Ethan Hunt (Cruise) and CIA agent August Walker (Henry Cavill) do a high-altitude, low-open (HALO) skydive into Paris. 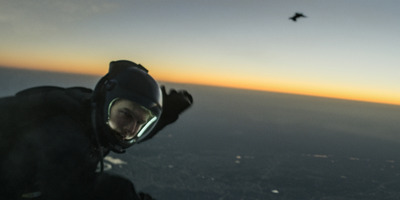 Though a stunt double did the jump in Cavill’s place, Cruise did the entire thing – jumping out of a C-17 plane from 25,000 feet and playing out the scene in free fall. According to Allan Hewitt, the “Fallout” skydiving coordinator, the plan to do a true HALO jump was almost thwarted by the Royal Air Force. Because the production’s home base was in England, the plan was to shoot the HALO scenes with the RAF’s planes and crew. However, the RAF refused to fly the “Fallout” team to an extremely high altitude. They would only let Cruise jump from 12,000 feet. But all that changed when Cruise broke his ankle while attempting a stunt for the movie. Because production was halted, they missed its scheduled time to jump with the RAF. With the wait time, everyone regrouped and agreed that the HALO jump would happen at the end of filming in Abu Dhabi, where Cruise would be allowed to jump from 25,000 feet. “If Tom didn’t break his ankle, we would have ended up faking it, which nobody wanted,” Hewitt said.